Place the dough on a pan covered with wax paper and put it in the fridge. 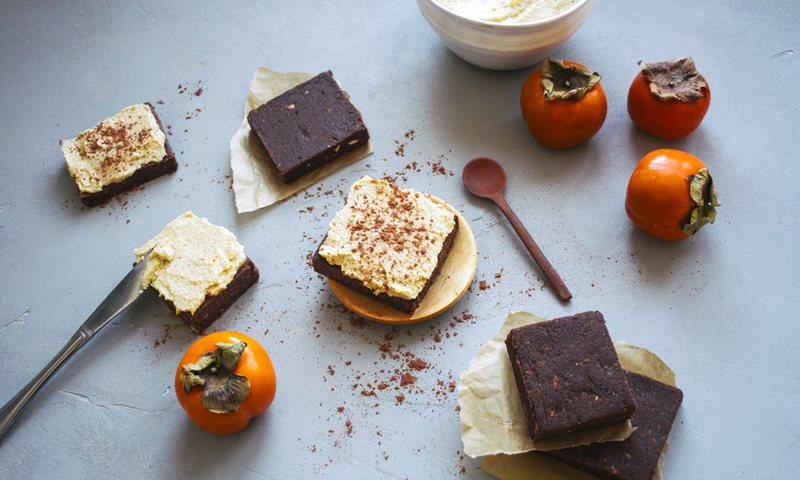 Frosting: Peel and slice the persimmons. 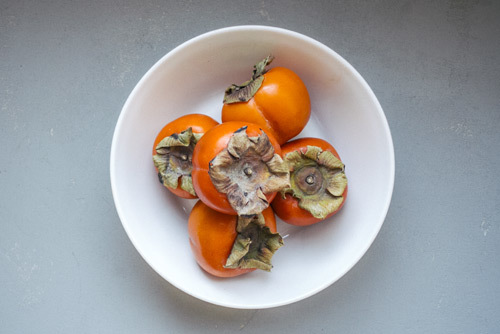 With a blender or food processor, mix the soaked cashews, persimmons, lemon juice, coconut oil, vanilla and water until smooth. Spread the frosting over the brownie cake and place it in the freezer until the frosting starts to get just a little hard. Cut the cake in small brownie squares and spread some raw cacao powder on the top before serving them. You can keep the rest of your brownies on the fridge by covering the tray with some plastic wrap. To make the crust: Place the nuts in a food processor, then add the dades, the lime, coconut oil, vanilla and salt until they become crumbs. Press the mix into the bottom of a pie form and put it in the fridge. To make the orange cream: blend all ingredients in high speed until you get a soft and smooth consistence. Place it over the nuts and dates crust and keep it in the freezer overnight. To make the chocolate layer: in a saucepan melt the cacao butter in a double boiler then add the cacao powder, stir with a spoon until it gets liquid. Remove from the heat and add the maple syrup, vanilla and salt. Pour it over the frozen cake and keep it in the freezer for a couple of minutes. Before you eat the cake add the berries on the top and move it out of the fridge for about twenty minutes. 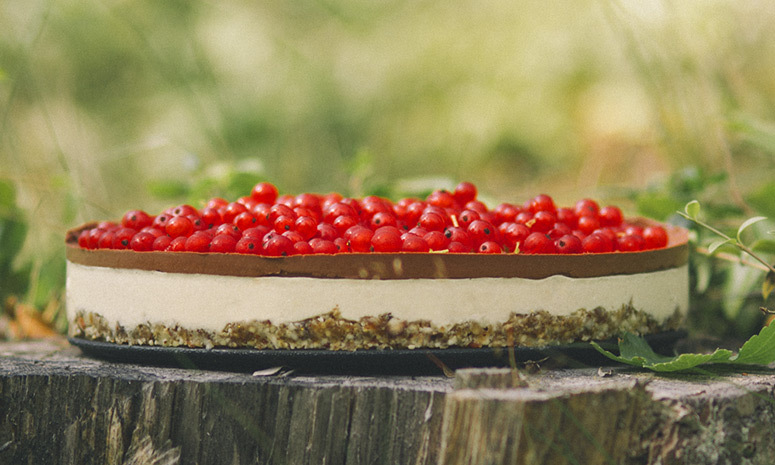 I love to decorate it with some fresh berries, you can choose your own favourite! Base: Place the oats in a food processor and blend until they turn into a flour. Add the dates, coconut oil, coconut shreds and process until everything stick together. Press the dough into a baking tray and keep it in the fridge. Lemon cream: Mix all the ingredients until you get a smooth cream. Taste, (you can add more maple syrup if you like it sweeter). Spread the lemon cream over the oat base by using a spoon and keep it in the fridge over night. Before serving, decorate the cake with some coconut shreds and lemon zest. Cut the dried apricots and pineapple in small pieces. Roast the hazelnuts in a pan until they get crunchy, then let them cool. Using a food processor, grind the hazelnuts until you get small chunks. Place all the dry ingredients and coconut oil in a container stir with a spoon. Now add the water and stir again. Pour the mix uniformly in a form covered with baking paper (you can add some extra pumpkin seeds on the top). Put it in the fridge for a couple of minutes as you preheat the oven 250°C. Bake for 25-30 minutes. Let them cool before you slice them into pieces. You can eat your flapjacks with some fresh fruit and natural yogurt. If you would like to store them, keep them in a closed container in the fridge. Blend the avocados in a food processor. Add the chocolate, dates, a pinch of salt and the juice from the orange. Mix until you get a smooth and creamy consistence. Place the pistachios in a food processor, and mix until you get a chunky powder. Make it pretty by covering the mousse with some pistachios and the zest of an orange. "At home... in the mood for something sweet"
Raw tarts: Place the nuts in a food processor and blend on high until the nuts are finely ground. Put them in a bowl. Place the dates in a food processor and mix, when they turn into a cream, they're done. Put them in the same bowl as the nuts. Add the raw chocolate and the sea salt. Work with your hands until you get a compact dough. First make small bowls, and from here small tarts. Put them in the freezer / fridge while you're making the cream. Mango cream: Mix the cashews, mango, lime juice and maple syrup with a blender until you get a smooth texture. Remove the tarts from the freezer / fridge, put some filling on the top using a small spoon. Garnish with crushed nuts, cacao nibs, mint leaves, fresh blueberries. I love to make them different every the time.